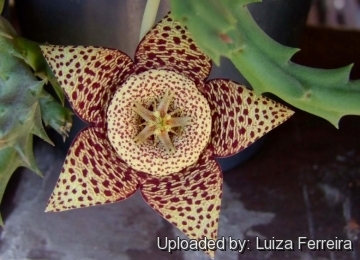 = Orbea lepida (Jacq.) Haw. Syn. Pl. Succ. 13 13 1812. Origin and Habitat: South Africa. Orbea lepida was raised from seed sent from South Africa by Scholl (ex Jacquin), cultivated specimens! 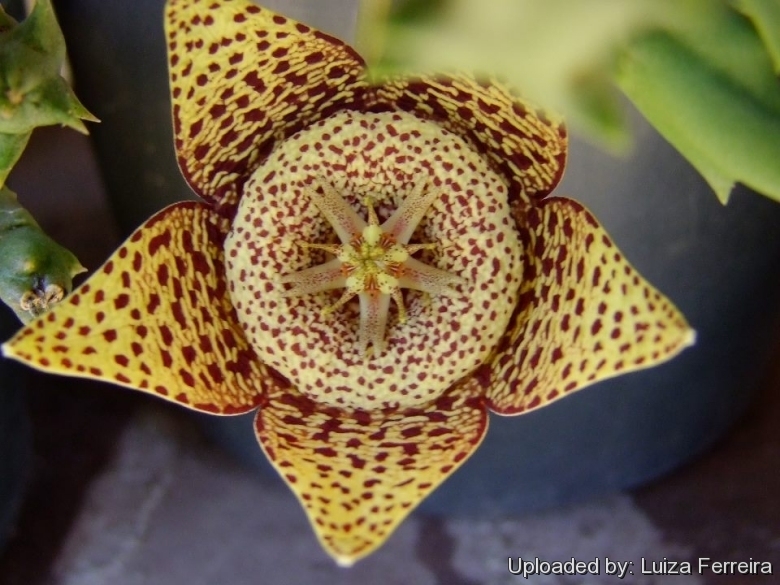 Description: Orbea lepida (syn= Stapelia lepida) is a fleshy-stemmed, perennial succulent member of the Asclepiadaceae family very like Orbea variegata, but the branches are green not glaucescent, and its flowers are very much smaller and have a different appearance. Pedicels usually twin. Corolla greenish yellow to sulphur-yellow with purple-brown dots with a paler circular bulge (or annulus) around the corona scattered with smaller purple spots. Outer branch of inner corona subulate acute inner one obtuse. However it is hard to tell apart one from the other by body characteristic. In accordance with the variability of the species Orbea lepida is invalid and nowadays considered as a synonym of Orbea variegata. Habit: Compactly branched, glabrous in all parts, it form small clumps or mats. Stems: 5-7.5 cm long, 8-10 mm thick, glabrous. **Flowers:*** 1–2 together near the base of the stems, successively developed. Pedicels 18-25 mm long. Sepals 4-5 mm long, ovate, acute or acuminate. Corolla rather small, about 3.5-4 cm in diameter, with a distinct annulus on the disk; inner face transversely rugose on the lobes, granulate-tuberculate on the annulus, glabrous and not ciliate, sulphur-yellow, covered with rather small irregularly scattered dark purple-brown spots, without intermingling lines, those on the paler annulus smaller than those on the lobes, which are about 12 mm long, broadly ovate, acute; annulus with a recurved-spreading acute margin. Outer corona-lobes 3 mm long, 1.5-2 mm broad, oblong, emarginate or bifid, sometimes with a minute tooth at the base of the notch, very pale, greenish or greenish-yellow, with or without a central suffused and dotted stripe extending to about 2/3 of the way up or some dots around the teeth. Inner corona-lobes 2-horned, pale yellow or greenish, with or without purple-brown dots; inner horn 3-3.5 mm long, erect, recurving at the slightly clavate apex; outer horn ascending-spreading, half as long as the inner or shorter, subulate. Cultivation and Propagation: Orbea lepida is very easy to grow, it is the ideal plant for beginners.